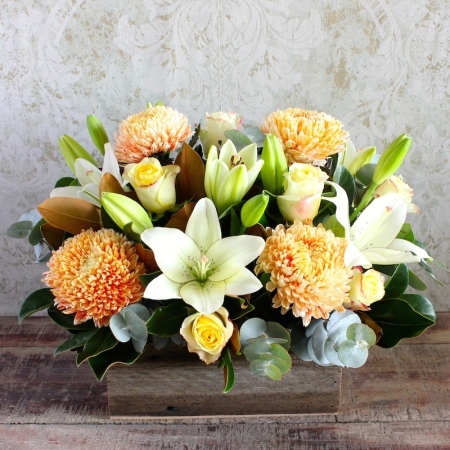 This vibrant,rustic arrangement is made up of Tiger Lilies,Chrysanthemum Disbuds and Roses displayed in a natural wooden trough. A perfect gift for someone with a rustic or country style home, with its Autumn tones this beautiful display will bring a pop of colour to your home or office. Order now and let our florist create something dazzling for that special occasion. Why not add on some delicious chocolates of wine to make this gift even more impressive.